Hi, does anybody know where I can purchase a driver seat leather replacement. I believe at the dealership they charge close to $1000 and I was wondering if anybody purchased it from a different vendor? I have ecru colour. That's high...they are charging you for the OEM Lexus leather seat cover in Ecru and I'm sure a healthy slice of labor costs. I've had seats on rx-7's, 300z's and Supra's completely redone at local leather shops here in Dallas for about $400-$500 over the years. I'd check local upholstery shops...maybe buy the OEM leather skins from Sewell Lexus Parts and then have local shop install to save on labor? Not sure if you need the seat, back or both. How's your passenger's seat? My passenger seat is in excellent condition. 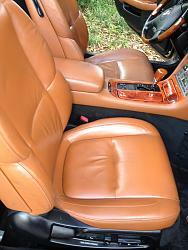 I got a response from leatherseats.com via ebay and for our cars is a special order pattern with a 4-6 week build time. Pricing start at $999.00 in a deluxe leather content, which has leather seating surfaces on the front seats; matching vinyl sides/back. The rear seats have leather inserts only with the rest of the seating surfaces and sides in a matching vinyl. Do you guys think is worth it? Last edited by adi; 09-19-11 at 09:15 AM. $1500 and change for the bottom part and $1700 and change for the back part . More than $3200 for the driver seat only. My local lexus dealer quoted me $1100 for the bottom part and I didn't bother to ask for the back part. Last edited by adi; 09-19-11 at 09:48 AM. As an alternative you might want to consider recovering your seats in Alcantara. Many of the higher end European (Porsche, Lamborghini, Bugatti, Formula 1, etc.) are using this material on steering wheels, seats, headliner, door panels, etc., due to the material's toughness and comfort. Alcantara can be bought for about $100 per yard and I'm guessing to recover a seat shouldn't take more than two yards. A good upholstery shop should be able to do the work reasonably. I've recovered my steering wheel in the material and had my rear headrests redone due to the original leather pulling away. I'm in the process of recovering the door armrests and probably will do the center armrest also. There's a color that comes very close to matching the factory ecru color. I don't think you'll be disappointed with Alcantara from a comfort standpoint AND no one else will have a seat like your's! LOL! My wifes SC430 had one fair/good seat and the drivers side was very poor. I found a used RH seat at a salvage yard, and after a few minutes of elbow grease, has it shined up and installed. Total cost, with the leather, frame, motors, memory CPU, all assembled and installed (by me), $150.00. Took me a month to find this in saddle leather. My advise is to be patient, scan the web regularly and results will follow. Last edited by marty99; 11-01-13 at 06:07 PM. Any chance that you have before and after pictures Marty? So far, all I have is a photo of the passenger seat, with the drivers seat in the background. Big contrast. I'm excited to get the new seatback for the RH seat. Attached is the crappy original seat, and a shot of the old with the new. go on amazon search for "Seat Shop" they sell the front pair new oem for $299.00 plus $29.00 for shipping, any color. Here is a link to a DIY leather replacement using the Seat Shop materials mentioned above. Much less expensive than Lexus OEM leather. I'd get the material from a source like Seat Shop and because I'm lazy have a pro upholstery shop install. The pros can steam the foam to plump it back up, pad up any worn pieces, and heat/steam the leather to remove wrinkles. Last edited by Jabberwock; 11-06-17 at 05:19 AM. Hi folks, I’m a newbie to this forum and hope it’s ok to post this here. I own a 2004 Lexus SC430 with Ecru interior & want to replace my front seats. I found a pair of 2002 Ecru seats in mint condition and I’m wondering if there are compatibility issues with putting these into my 2004? I ask as I had salvage yard guy tell me the heater & seat motor cable connectors between the 02 & 04 are not compatible, so I’m wondering if anyone knows for sure if that’s the case, or if there’s any other issues I should be aware of? Many thanks in advance for any help on this one. two connectors on the left and three on the right. the passenger has a third connector for the seat weight Detector...it enables/disables the airbag. Last edited by Bgw70; 11-15-17 at 01:17 PM. Ah man that’s really good to hear and certainly what I was hoping to be true. I’ve been looking religiously for months and almost bought some so-so condition 2004 seats when these mint 2002 seats popped up on EBay literally minutes before I was about to buy the others, geez I feel lucky. Many thanks for the quick & clear reply. Really loving this forum, it’s such a great resource. Btw, I wanted to say what a really great job you did on redoing your seats, it is a heck of a lot of work and they really look great! I also bought the LSeat "Ecru" covers via Amazon and they turned out just great, but the leather is not quite as smooth as I would have liked. If anyone is interested I'll be selling those (the complete seats) once my new ones arrive next week. This includes the driver & passenger seats (seat heaters and motors all working perfectly) plus the center console all newly recovered & they really look/feel/smell like new. 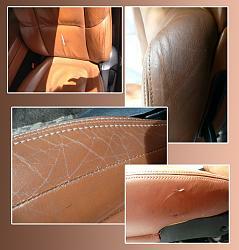 This is to all of you who have problems with your lexus leather seats. Whether this is discoloration or cracks I found the perfect person. First of all I found this web site last ngiht while searchnig to repair or replace the cover. I damaged my leather seat with some gum stuck to my navy blue scrub. Go figure gum mixed with navy color on a baige color leather. I tried to clean it with an all purpose dleaner to get the gum out but I made a mess, then I placed the rag on intact elather on the sest and befroe you know it the entire seat was runied. I saw peels of leather comping off and color was blue all over.....I called an upholsetry company and they told me to call Lexus and ask for interior repair company they use. I called Tustin, Ca Lexus and the lady in service department was very hesitant to give me the info and was insisting of making an appointment for me to bring it in for repair. But I was persistent and told her that is my right to know which company will be repairing my car and finally after a few long and short holds she came back with a name and number. A solo guy that Lexus and BMW use to repair our leather seats. His name is John. Very nice guy. He came and fixed it in 30 minutes for $100. Fantastic job. In my dreams I couldn't see it like this. It looks better than day one. He even touched up leather cracks on the sides. Oh my God what a faboulos job he did. Because of him i came back here tonight and signed up on this web site just to display this message to all of you with the same problem. His info: John 714-814-4753. You wont regret it, he is the best. He will be my leather man as long as I live.